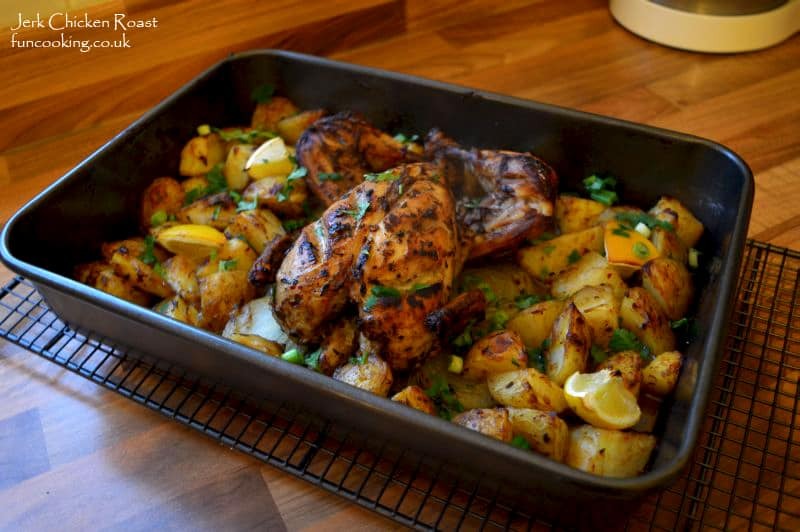 Jerk Chicken Roast recipe with jerk spiced baked potatoes. An easy,tasty family meal. I am a big fan of Sainsbury’s products.Very nice quality and good prices. 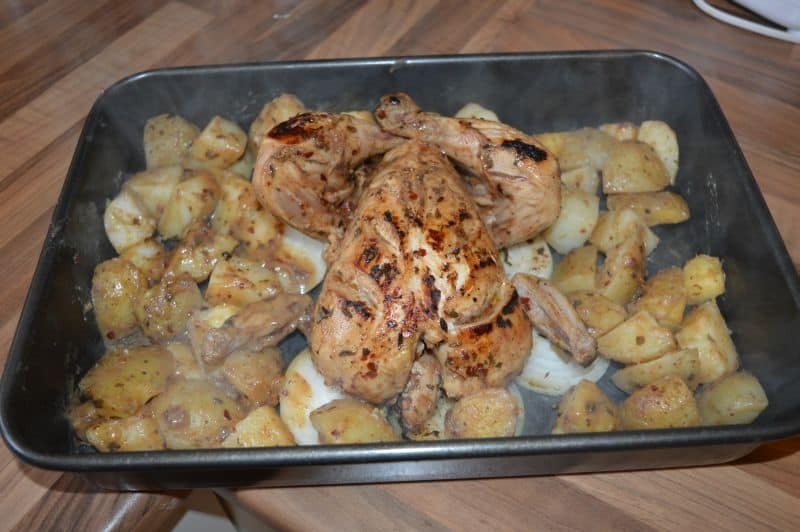 I made this roast with Sainsbury’s Jerk Marinade. It is a flavorful sauce, I really liked it. I used this sauce first time and me and my family loved it. I marinated the whole clean, dry chicken for almost 24 hours with this sauce then baked it with the remaining marination coated potatoes. 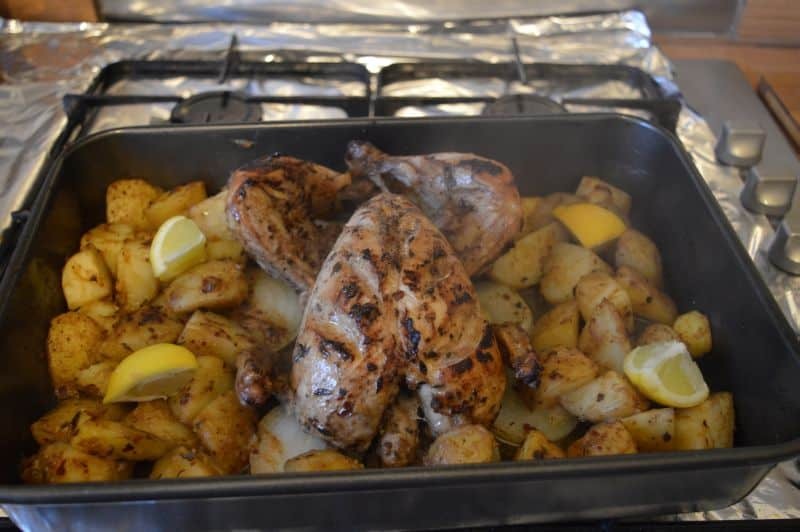 After baking I sprinkle a little peri peri salt on potatoes and squeeze half a lemon on chicken and potatoes and yes easy and delicious meal with less effort. Also try my other Roast recipes . 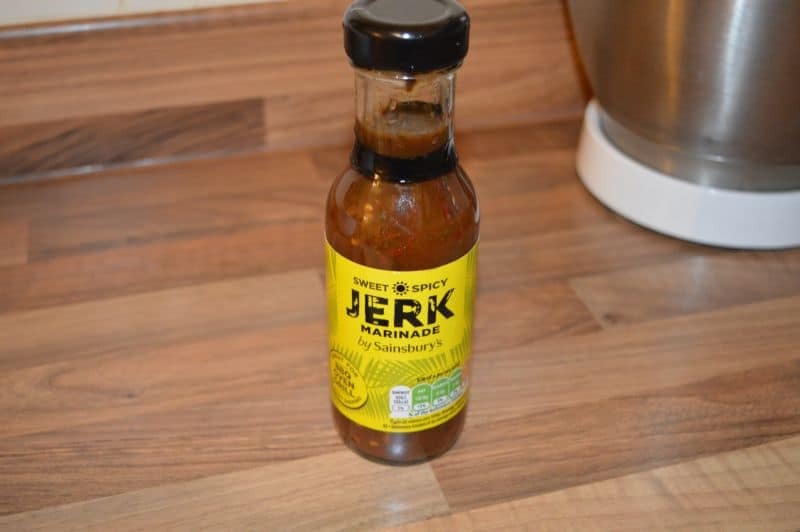 I have used this jerk marinade. 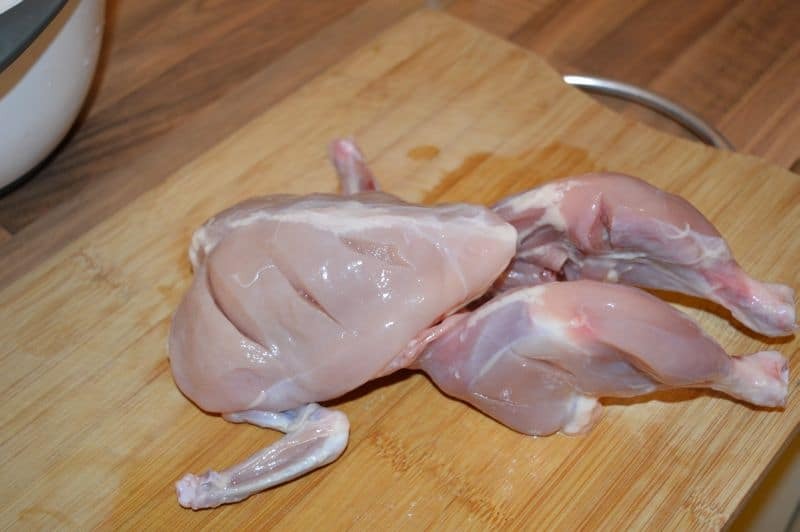 Take whole chicken, wash and dry nicely then give light cuts all over it. Pour almost half bottle on chicken with 1/2 tsp salt. rub nicely. Cover and marinate it over night. 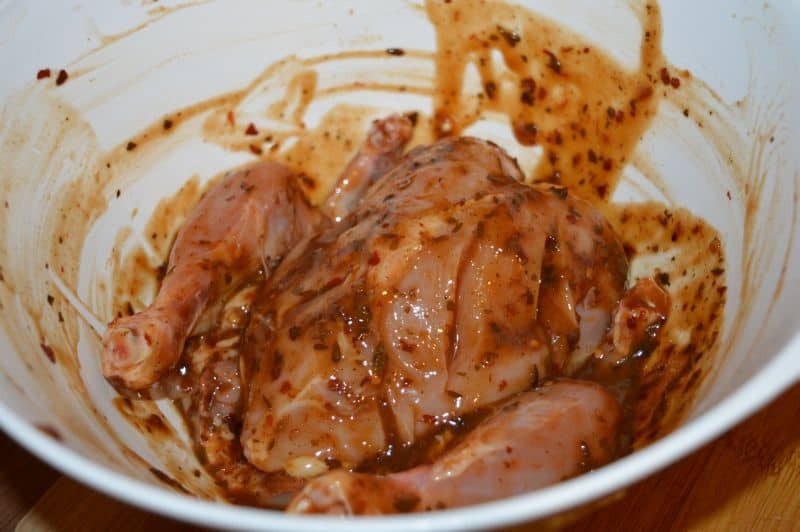 Or if you don’t have time then marinate it for 2-3 hours. 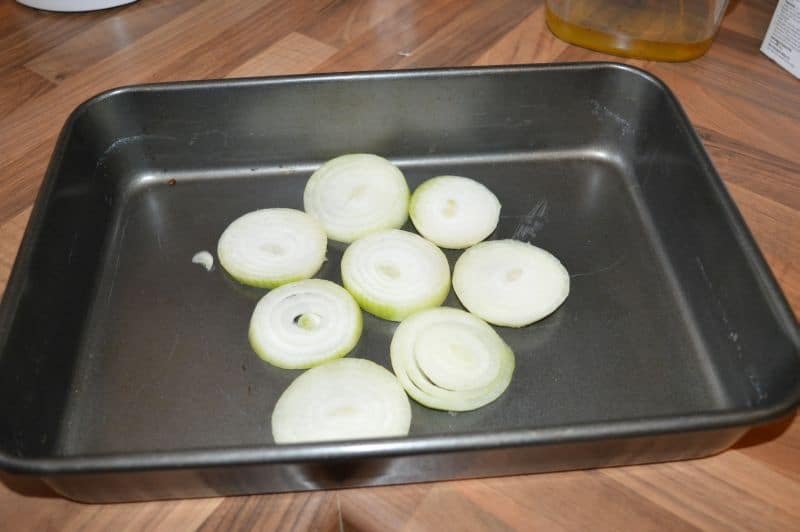 Heat a nonstick fry pan. Add in 2 tbsp oil. Coat the fry pan with this. Fry should be very hot before adding in chicken. Now on high heat place chicken breast side down on it. Cook for 2-3 minutes. 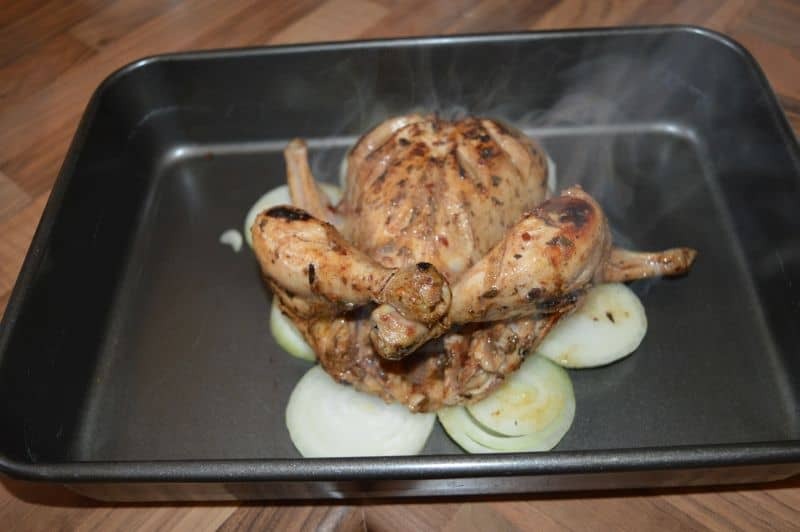 Flip the chicken and cook it on same high heat for 3-4 minutes on other sides. Take a roasting try. Keep 2 onion thick sliced in middle. 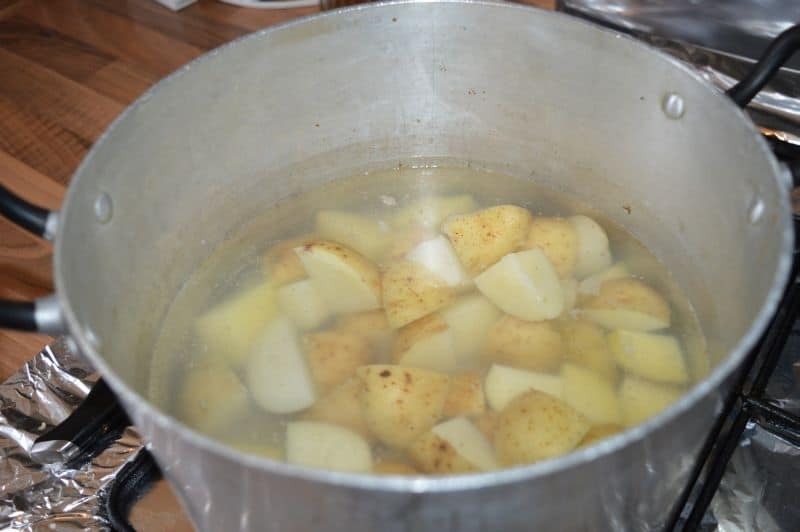 Cut potatoes in medium size cubes.Boil potatoes until almost fully cooked with 1/2 tsp salt. Throw all water. Shake them a little in the sieve. this will give them a crispy texture while baking. 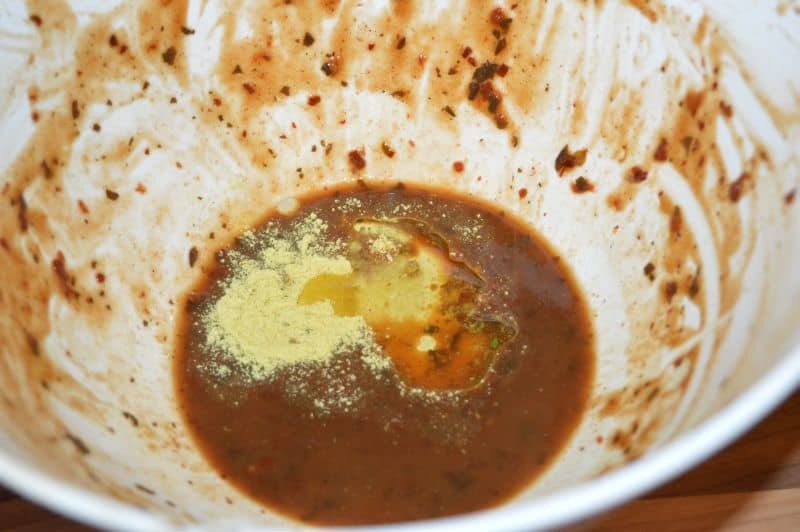 Now In remaining chicken marinade add in 1 tsp chicken powder and 2 tbsp oil. Mix well. Coat cooked potatoes in it. 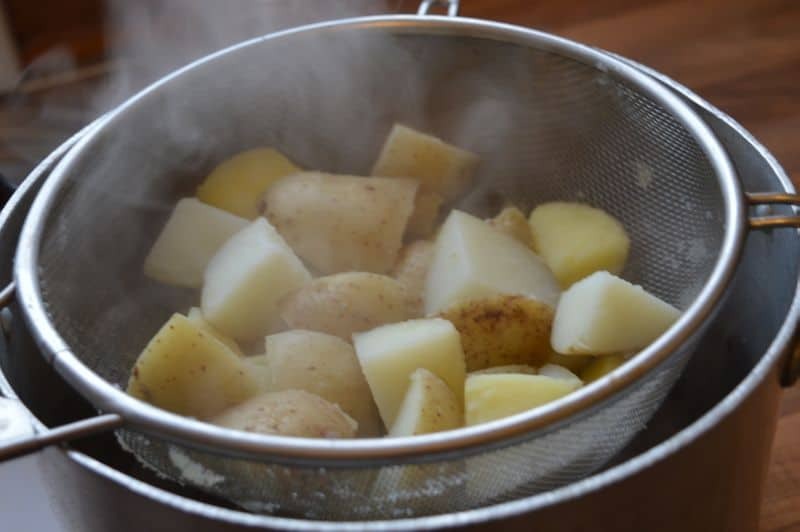 Place marination coated potatoes in tray. Also cut half lime in 4 pieces and keep on potatoes. 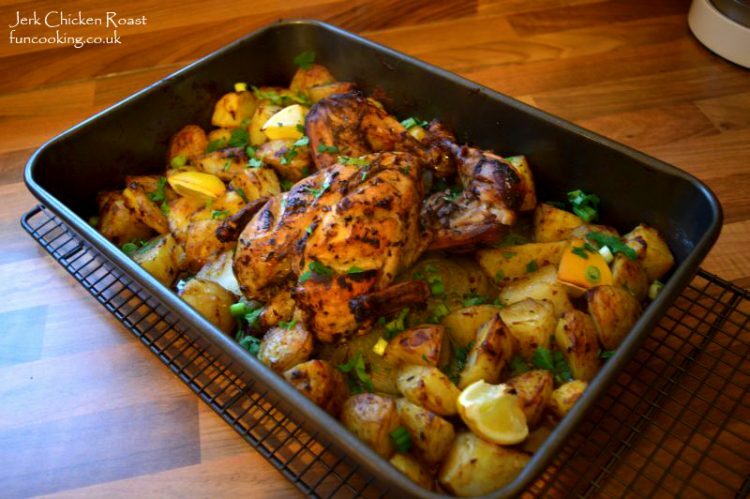 Bake chicken and potatoes at 180 C for almost 30-35 minutes. 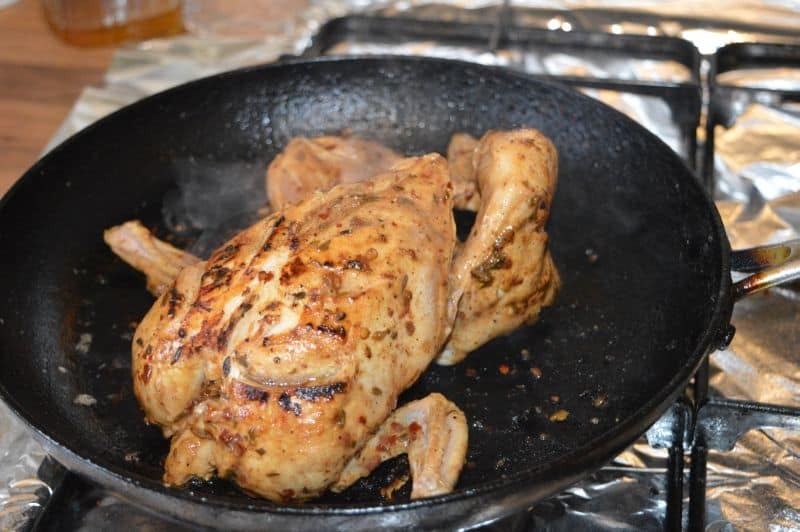 After almost 30 minutes, take out the chicken pour 1-2 tbsp oil on it and bake again on 250 C for 10-15 minutes. 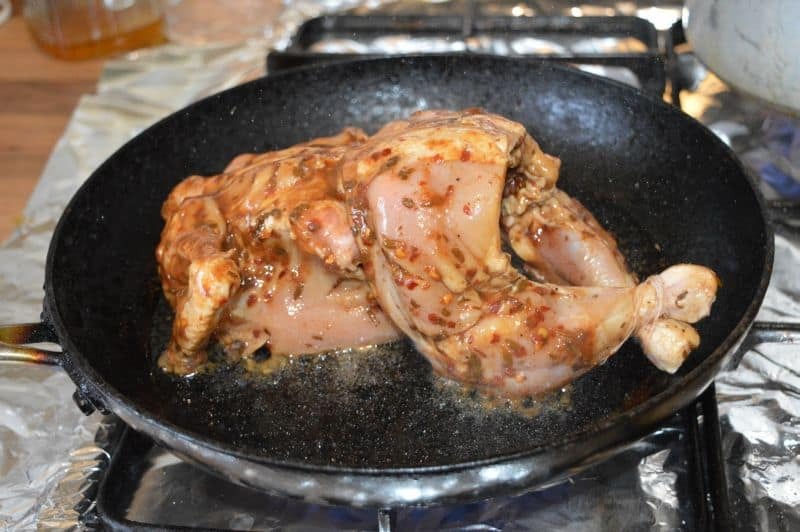 Do not worry if this chicken releases it’s water, when you bake it on 250 that water will evaporate and you will get a little thick sauce in bottom, which will give this chicken even more taste. 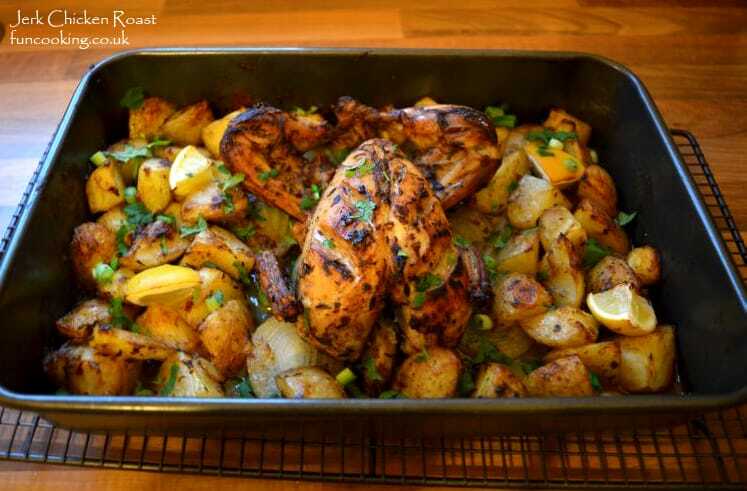 Jerk Chicken Roast with jerk spiced potatoes is ready. Sprinkle some spring onions and coriander with some peri peri salt on potatoes. Squeeze half lime and serve.